Cherry Mobile Big Octa Core Blowout Announced! Get Discounts Up To 5000 Pesos! Home / cherry mobile / mobile / news / Cherry Mobile Big Octa Core Blowout Announced! Get Discounts Up To 5000 Pesos! 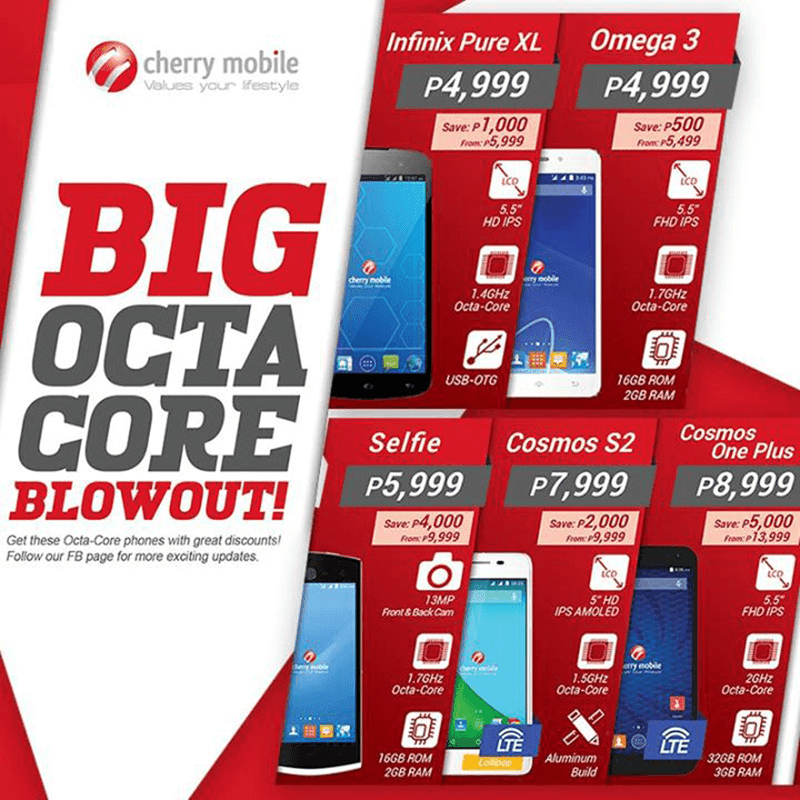 Now official, Cherry Mobile cuts the price of most of their octa core offerings with this "Big Octa Core Blowout" sale! That includes the Infinix Pure XL, Omega 3, Selfie, Cosmos S2 and Cosmos One Plus. Cherry Mobile Big Octa Core Blowout! From 5,999, you can now grab the 5.5 Inch octa core goodness of Cherry Mobile Infinix Pure XL to just 4,999 Pesos. The Omega 3 with 1.7 GHz octa core and 2 GB RAM which was originally priced at 5,499 is down to 4,999 Pesos as well. Then the Cherry Mobile selfie which is probably the best locally branded Selfie phone is down to 5,999 from 9,999 Pesos. That saves you 4,000 bucks! One Cherry's most beautiful creation called the Cosmos S2 with AMOLED screen on the other hand is now priced at just 7,999 from 9,999 Pesos. The handset with the most discount is Cherry's most powerful as well, the Cosmos One Plus. It's a 2 GHz octa core powered device with 32 GB ROM, LTE connectivity and 3 GB RAM. You can now get that beastly handset for the very low price of 8,999 from 13,999 Pesos probably making it the most affordable handset globally in that setup.